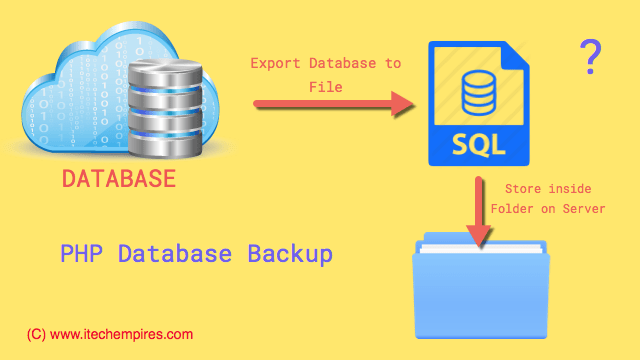 How to automate database backup in php? Let’s get started by installing this php packages using composer, create new folder on your server for this tutorial and execute following command. If you see output similar to the above lines to instructions then you php package is installed successfully and now you will see composer.json , composer.lock files and vendor folder created. Let’s install swiftmailer to send email notifications from the application. Create new file called index.php and also create new folder called database_backups within same directory. Note: make sure to update required database settings variable and smtp settings for swiftmailer. In the above script we are limited to only MySQL, you can switch from MySQL to other database anytime you just simply needs to use given class according the to DB Dumper library. Also, we are setting #filename variable to the same database_backups folder location you can replace it to anywhere you want for example user directory or /var/www/ directory it’s all depend on you. So now we are good to go to execute this php script using cron job on daily basis. Next login/ssh to your server and use following command to open cron job setting in edit mode. Replace path/to/your-newly-created-folder-name path to your folder path, you can easily find out path using pwd command. Now we are all set cron job is going to do the job, our database backup is automated, you will get email notification from the php script at 11:00 PM every night, keep in mind this time is totally depend on your server date time setup. Let me know if you have any issues related to this tutorial using comment box below.